This airticle is aboot the caipital o Libie. 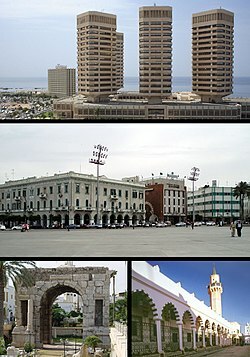 For ither uises, see Tripoli (disambiguation). Tripoli (Arabic: طرابلس‎ Ṭarābulus pronunciation (help·info)- an aa طرابلس الغرب Ṭarā-bu-lus al-Gharb Libian vernacular: Ṭrābləs pronunciation (help·info); derived frae "Τρίπολη"; the Greek wird for "three ceeties" in Greek: Τρίπολις Tripolis) is the lairgest ceety an caipital o Libie. The Tripoli metropolitan aurie (destrict aurie) haes a population o 1,065,405 (2006 census). The ceety is locatit in the northwast o the kintra on the edge o the desert, on a point o rocky land projectin intae the Mediterranean Sea an formin a bay. Tripoli wis foondit in the 7t century BC bi the Phoenicians, who named it Oea. Tripoli is the lairgest ceety, the principal sea port, an the lairgest commercial an manufacturin centre in Libie. It is an aa the site o Al-Fateh University. Due tae the ceety's lang history, thare are mony sites o airchaeological significance in Tripoli. The climate is typical Mediterranean, wi hot, dry simmers, cuil winters an some modest rainfaw. "Tripoli" mey an aa refer tae the shabiyah (top-level admeenistrative diveesion in the current Libian seestem), Tripoli Destrict, kent as the Tarabulus Destrict an aw. Tripoli lies at the wastren extremity o Libie close tae the Tunisian border, on the continent o Africae. Ower a thoosan kilometres separates Tripoli frae Libie's seicont lairgest ceety, Benghazi. Coastal oases alternate wi sandy auries an lagoons alang the shores o Tripolitanie for mair than 300 kilometres (190 mi). Till 2007, the "Sha'biyah" includit the Ceety, its suburbs an their immediate surroondins. In aulder admeenistrative seestems an throughoot history, thare existit a Province ("muhafazah"), State ("wilayah") or Ceety-state wi a hintle lairger aurie (though no constant bundaries), which is sometimes mistakenly referred tae as Tripoli but mair appropriately shoud be cried Tripolitanie. Emhemmed Elmgharief Street in central Tripoli haes some o the best examples o Italianate colonial airchitectur in Tripoli. The ceety's auld toun, the Medina, is still unspoiled bi mass-tourism, though it is increasingly being exposed tae mair an mair visitors frae abroad, follaein the liftin o the UN embargo in 2003. Housomeivver, the wawed Medina retains muckle o its serene auld-warld ambiance. The Red Castle Museum (Assaraya al-Hamra), a vast palace complex wi numerous courtyards, dominates the ceety skyline an is locatit on the ootskirts o the Medina. Thare are some classical statues an funtains frae the Ottoman period scattered aroond the castle. Three gates providit access tae the auld toun: Bab Zanata in the wast, Bab Hawara in the sootheast an Bab Al-Bahr in the north wall. The ceety walls are still staundin an can be climbed for guid views o the ceety. The Bazaar is an aa kent for its traditional ware; fine jewelery an clothes can be foond in the local mercats. Thare are a nummer o biggins that wur constructit bi the Italian colonial rulers an later demolished unner Gaddafi. They includit the Ryal Miramare Theatre next tae the Red Castle an Tripoli Railway Central Station. Fitbaa (soccer) is the maist popular sport in the Libian caipital. Tripoli is hame o the maist prominent fitbaa clubs in Libie, Al Madina, Al Ahly (Tripoli) an Al Ittihad. Ither sports clubs based in Tripoli include Al Wahda an Addahra. The ceety an aa played host tae the Italian Super Cup in 2002, a match in which Juventus (Italian Serie A champion haulder) defeatit Parma (Coppa Italia haulder) 2–1. Tripoli International Airport is the lairgest airport in Tripoli an Libie. Tripoli is the interim destination o a railway frae Sirt unner construction in 2007. ↑ Table (undated). "Libya" (requires Adobe Flash Player). Der Spiegel. Retrieved 31 August 2011. ↑ Hopkins, Daniel J (1997). Merriam-Webster's Geographical Dictionary (Index). Merriam-Webster. ISBN 0-8777-9546-0. Wikimedia Commons haes media relatit tae Tripoli. Livin tips an advices for Tripoli. Tripoli at goruma (German). Machine translation by Freetranslation.com. Google Maps showin "greater" Tripoli, roughly bundit bi Tajura on the east, Janzur on the wast, Qaşr Bin Ghashīr on the sooth. (View at 1024x768 screen resolution or adjust the cairt tae the described bundaries). This Libie-relatit airticle is a stub. Ye can help Wikipaedia bi expandin it. This page wis last eeditit on 10 Mairch 2018, at 19:26.